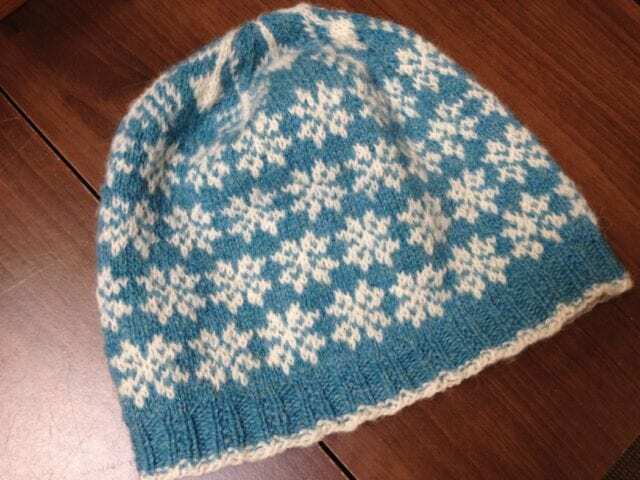 Show and tell: colorwork hats. 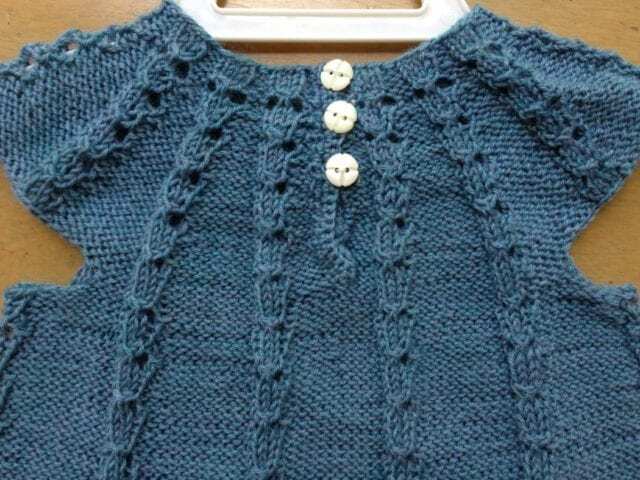 We love to see finished projects that started life as yarn on our shelves, and when I’m able, I love to photograph them and share them here on the blog. It’s been a busy spring so far, full of exciting new yarns, books, and magazines, all of which keep this blogger busy. Meanwhile, jaw-dropping projects keep coming through our doors, and it’s time to make time for show and tell. 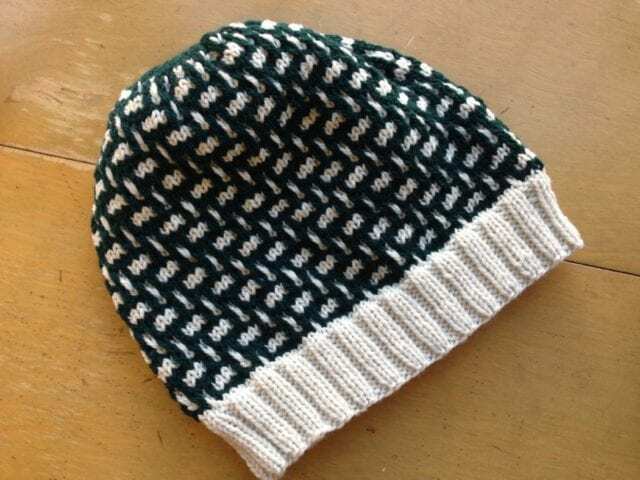 I have enough photos stockpiled for at least four blog posts – let’s begin with colorwork hats, on the heels of our HYS Colorwork Trunk Show. 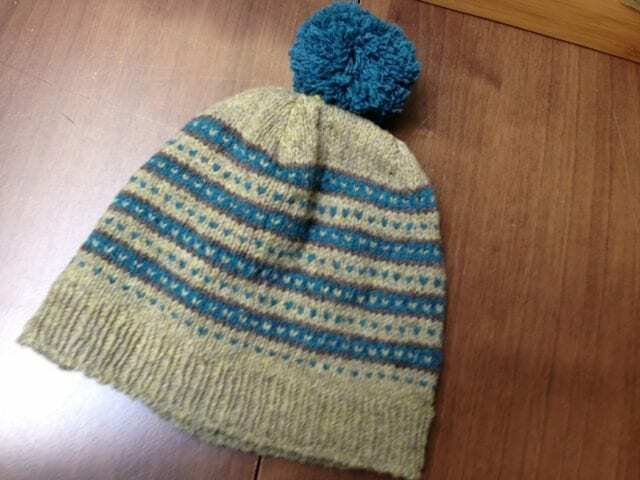 Here’s Joanne’s “Seeds Hat,” designed by Jared Flood and knit with Brooklyn Tweed Loft. The soft sage green with the bright teal is a surprising combination that works well, especially with a jaunty pom-pom on top. Sandy made a “Seeds Hat,” too, also using Brooklyn Tweed Loft; I snapped a photo just as she was weaving in the ends on this, her first colorwork project. 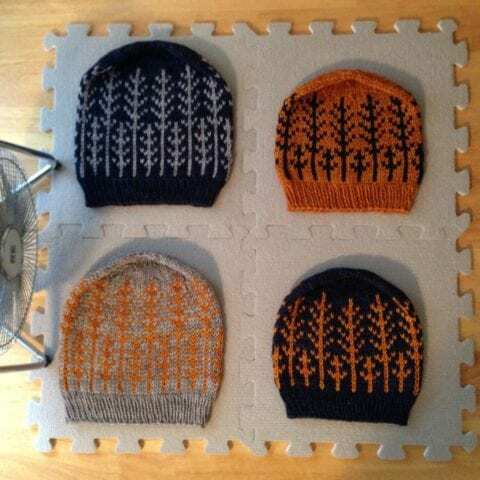 I made a family of “Banff” hats for my sister, brother-in-law, niece, and nephew for the holidays. I love Malabrigo Rios for its easy care, fun colors, and soft, squishy hand, and I love tincanknits’ straightforward pattern for its charming motif and huge range of sizes. 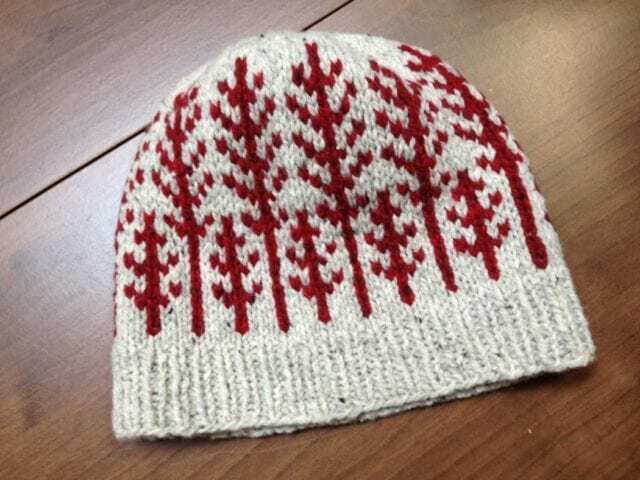 Marilyn knit this “Bousta Beanie” to practice her fair isle knitting technique before embarking on a larger colorwork garment; her even tension and excellent color choice show how ready she is for that exciting project. 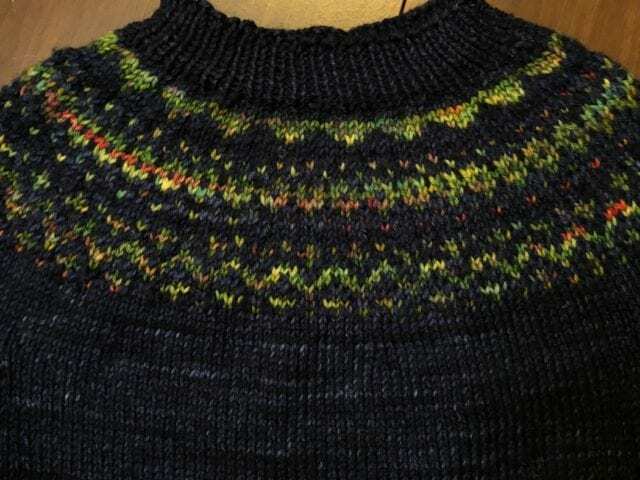 The yarn is Jamieson’s Shetland Spindrift, a classic choice for colorwork and a personal favorite of mine. 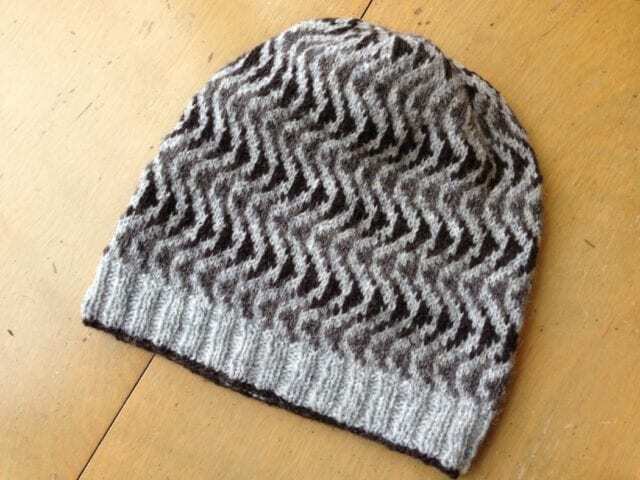 Kate has been knitting with Shetland Spindrift, too; this “Snawheid” was designed by Kate Davies, for whom Kate and I share a great admiration. This playful combination of bright blue and natural white suits the snowflake motif and shows the pattern so well! 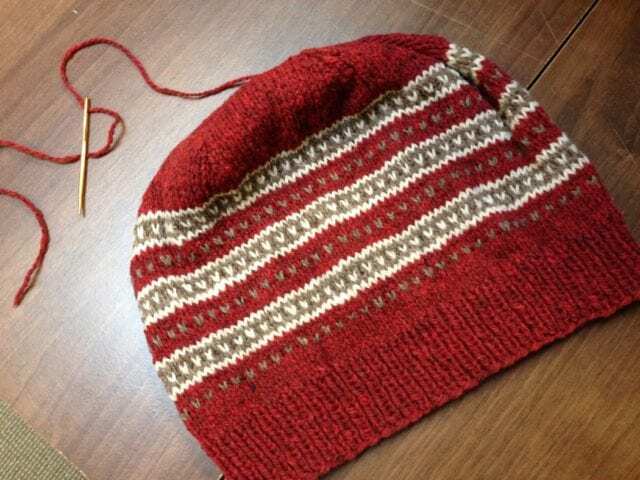 Margaretta’s “Tincture” hat is colorwork of a different kind – mosaic knitting, where some stitches are slipped and others are knit, for a color pattern with a bit of texture, too. 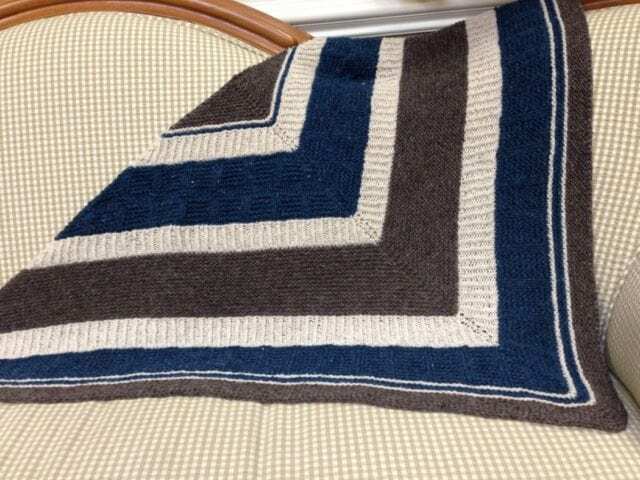 She used Brooklyn Tweed Arbor in a high contrast combination for a striking effect. Thanks to the knitters, crocheters, and weavers who bring in their work to show us what they’ve made! You inspire and amaze us, and we can’t wait to see what you get into next. Keep an eye on this blog for more show-and-tell soon! 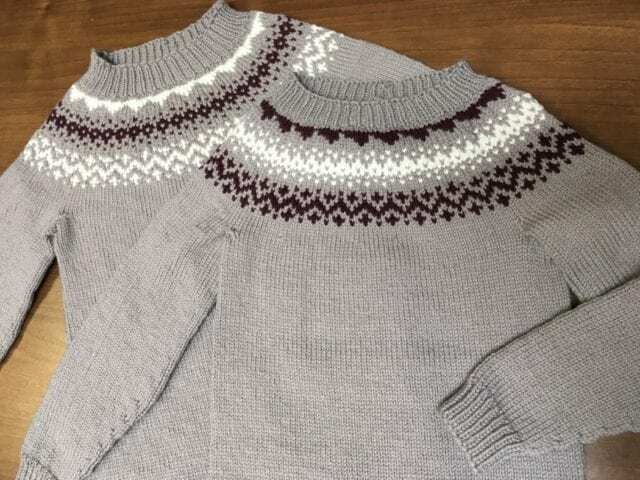 Show and tell: Shelter sweaters. The extra cold weather we’ve had lately has brought out some incredible knitwear! 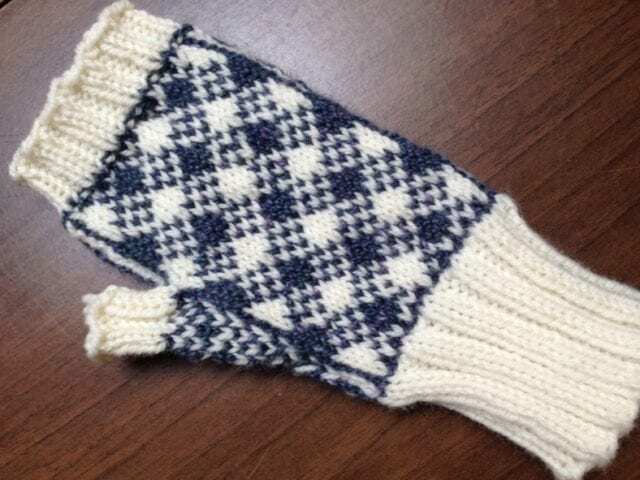 Almost everyone who comes through our doors these days is bundled in handmade woolens. As a result, I have quite a pile of show and tell photos to share, and sifting through it, a few themes have emerged. For today’s post, that theme is sweaters knit with Brooklyn Tweed Shelter, a yarn I consider perfectly suited to sweater-making. 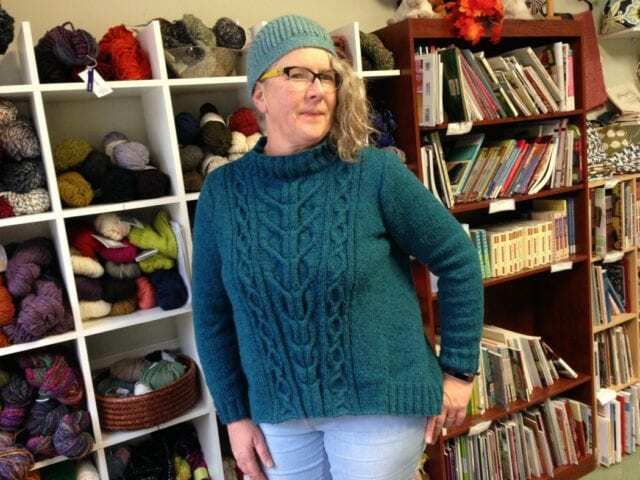 Here’s Marcy in her “Grow” sweater by Norah Gaughan, from Hannah Thiessen’s recent book, Slow Knitting. 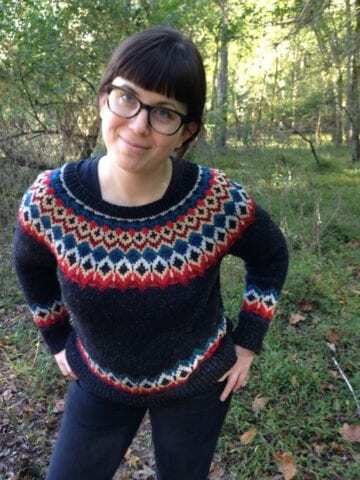 Made with Brooklyn Tweed Shelter in the playful Tartan colorway, Marcy calls it her January sweater, the warm-but-not-heavy garment that will see her through this chilly month. 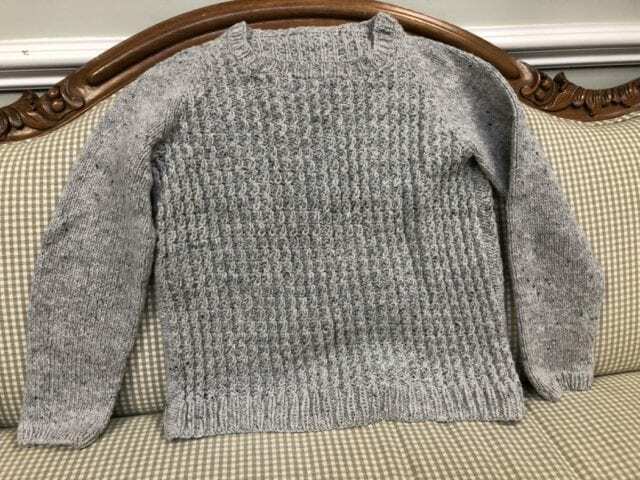 The construction of this sweater is more intriguing than this photo lets on, with diagonal side seams wrapping from the narrow back piece to the wider front – an interesting knit, no doubt! 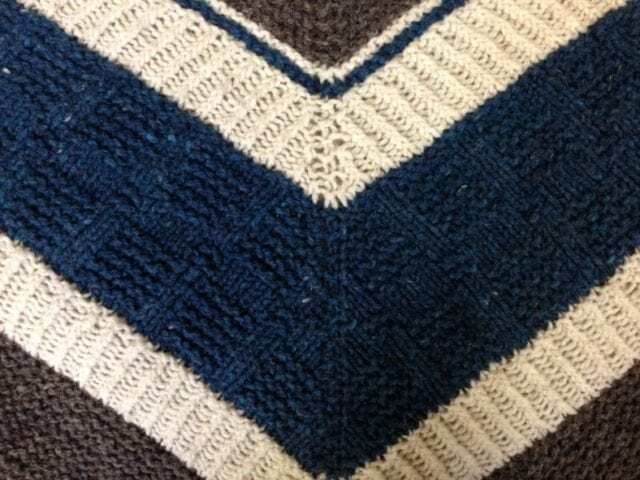 Grace’s recently-completed “Tinder” is knit with Shelter in Almanac, a rich blue. This Jared Flood design features an all-over knit/purl texture pattern, straightforward to execute and satisfying to see. 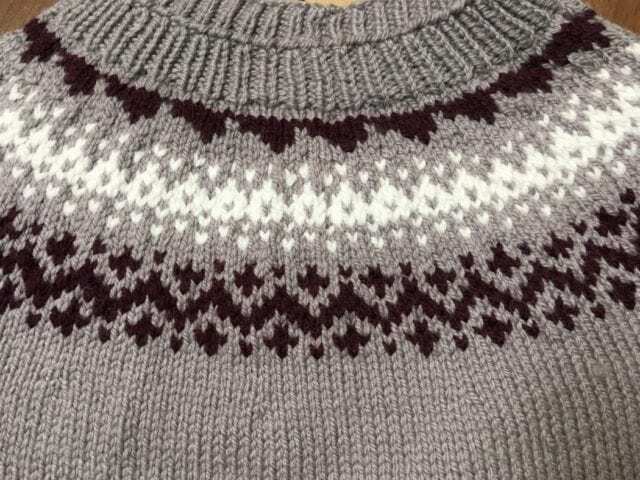 She wore it into the shop just after finishing it, and kindly let me photograph it while our ballwinder prepared her next sweater’s worth – a knitter after my own heart, following one sweater directly with another. Leslie is another serial sweater-knitter; above is her latest, Michele Wang’s “Bedford” pullover knit in Snowbound, Shelter’s lightest gray. 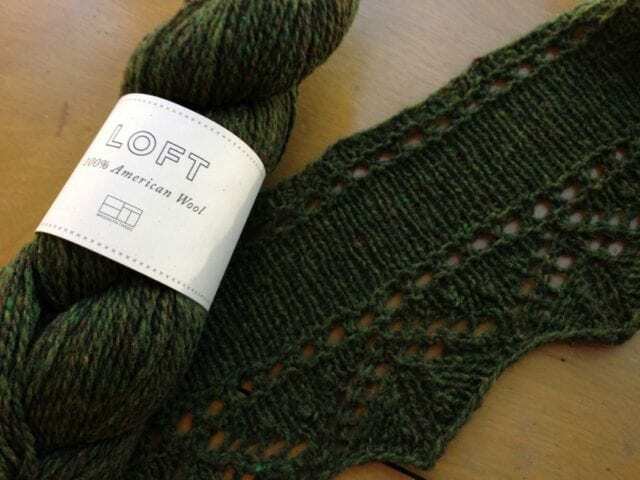 Like “Tinder,” “Bedford” is all about a simple repeated texture pattern, though this one has a bit of a cable twist. It’s a cozy sweatshirt of a sweater, the kind of garment one wouldn’t mind wearing day after day. 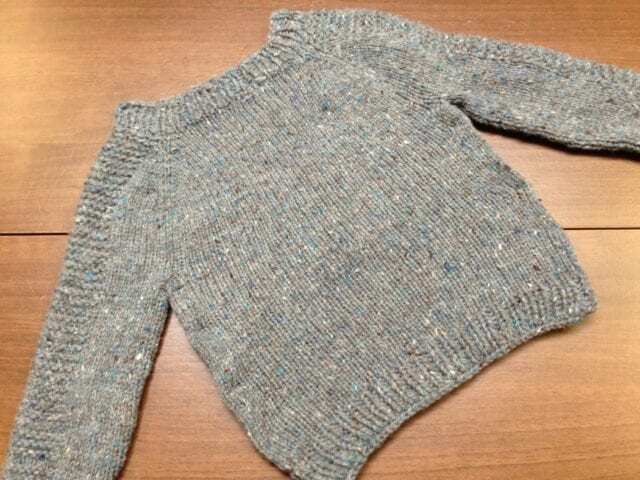 This little tincanknits “Flax” was knit by Emily for a new baby in her family, and Shelter in Faded Quilt was the perfect shade of blue gray. 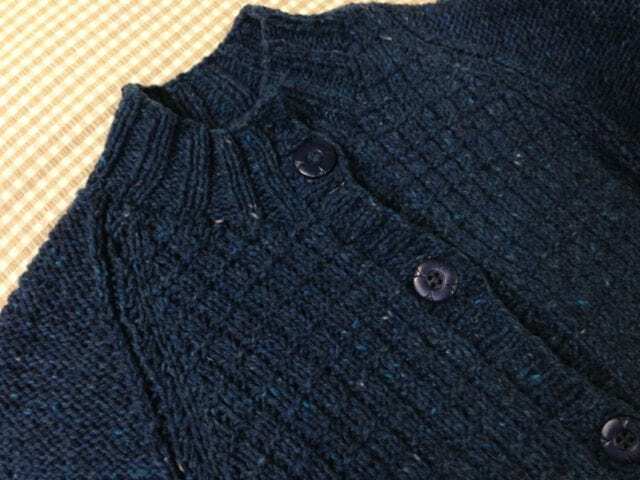 I haven’t knit as many baby sweaters as some, but “Flax” is one I made for my nephew, and I often recommend it. I love the rustic look of Emily’s in Shelter! I, too, have knit a sweater with Brooklyn Tweed Shelter, and here I am wearing it. 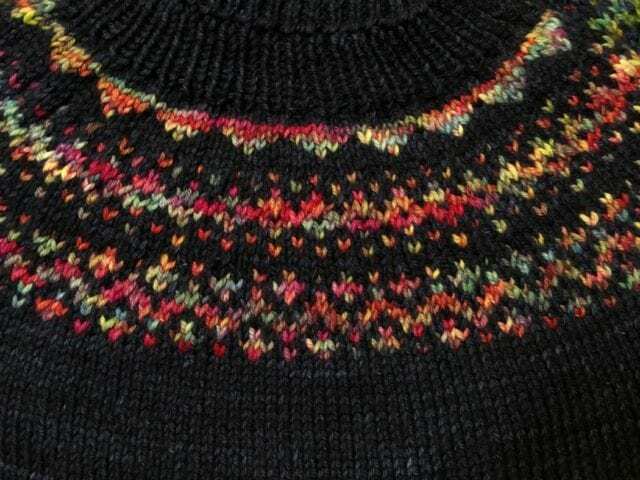 This is Bristol Ivy’s “Second Grace,” a pullover in my favorite sweater genre: bottom-up, colorwork, circular yoke. I labored over the selection of seven colors, wanting to branch out from my usual blue or gray and stymied by the abundance of amazing colors in the Shelter palette. Ultimately I landed on Cast Iron for the main color, and Long Johns, Cinnabar, Tallow, Almanac, Tartan, and Snowbound for contrast colors. 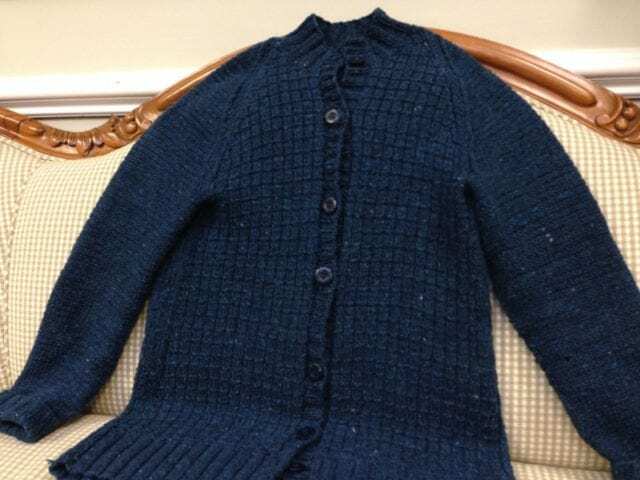 I’m so pleased with this garment – you will likely see me wearing it a lot, and it may not be long before I knit another sweater in Shelter. A warm thanks to all of you who bring your finished projects in to share with us, we are so inspired by what you make and we can’t wait to see what’s next! Show and tell: Brooklyn Tweed, part 2. Earlier in the week, I shared a few of the many Brooklyn Tweed works-in-progress that began life as yarns on our shelves. 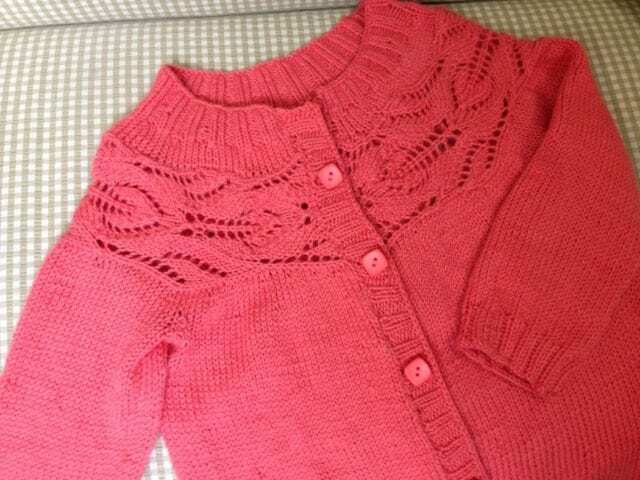 I can’t wait to see them all grown up and completed, just like this next group of garments. 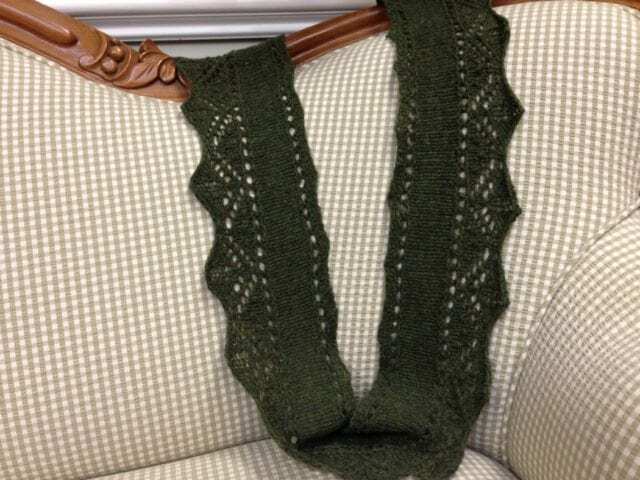 Nancy knit this “Pei” cowl by Michele Wang with just one skein of Brooklyn Tweed Loft, using the color “Birdbook,” a mossy green. She kindly left it with us to display for awhile, so look for it next time you’re here at the shop! 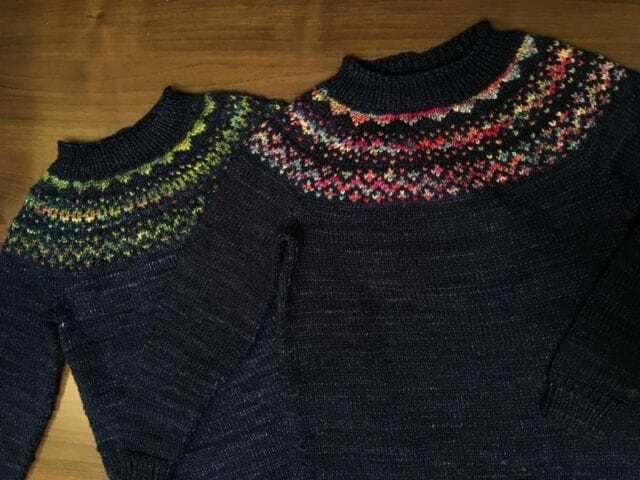 Katherine used Brooklyn Tweed Arbor in “Hammock” and Fibre Company Acadia in “Blueberry” together to knit these “Gimmers” by Ann Kingstone. 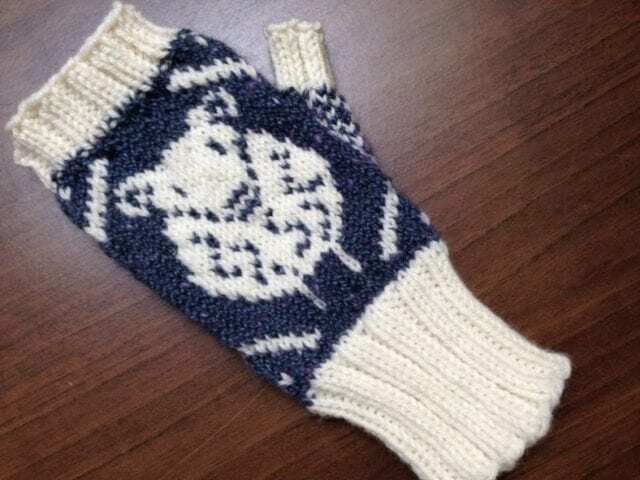 Technically this is a work-in-progress, as the second mitt is still underway, but I couldn’t resist photographing this stunning bit of colorwork, even before blocking. I knit this “Banff” hat by tincanknits in three sittings, loving every stitch of Brooklyn Tweed Shelter, plotting a sweater with it already. The yarn is soft and light, feeling somehow spongey or doughy in the hand, and strange as that description may sound, it’s such a satisfying fiber to work with, I can scarcely recommend it highly enough! 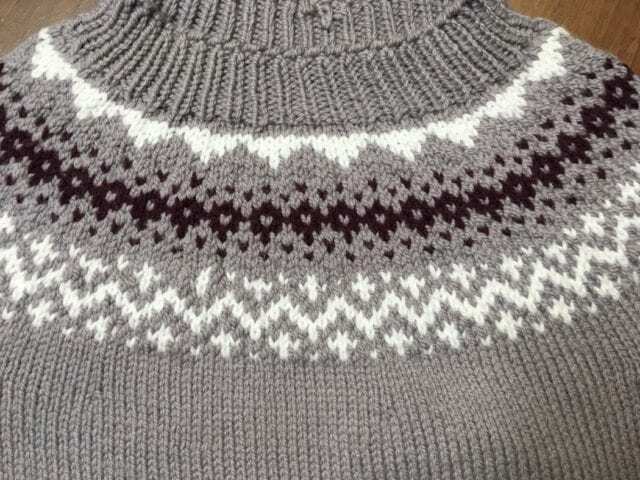 I chose the colors “Snowbound” and “Long Johns,” an evocative combination. Her upcoming class on the subject still has a couple of openings; sign up now if you’d like to claim one! Thanks to all the knitters, crocheters, weavers, and other fiber artists who begin their projects with a trip to the Hillsborough Yarn Shop, and thanks to those who bring them back to show us the finished product!